The APAC air purifiers market revolves around the major end-use industries which include residential and commercial sectors. The commercial end-user industry dominated the APAC air purifiers market in 2016 and is expected to grow at a CAGR of 25.2% respectively between 2017 and 2026. Air purifiers are devices used to purify the indoor air in homes, offices, hospitals, cars, and classrooms, among others. These air purifiers have different filters with the help of which the purifier cleans the air. Some of filters used are high efficiency particulate air (HEPA), activated carbon filters, electrostatic precipitators, and ionizers, among others. These filters are mainly used in conjunction with one or more filters to increase the product efficiency. With the help of these air filters, air purifiers can curb health risks owing to rising pollution, allergies caused due to pollen and dust, and avoid exposure to harmful chemicals and smoke. Additionally, the end-users have started to realise the advantages of using air purifiers to prevent the intake of impure air and harmful pollutants. This, combined with increased R&D activities, have led to the growth of the APAC air purifiers market. It is expected to grow at a CAGR of 24.5% and 26.2% ($milllion) and (‘000 Units) between 2017 and 2026. The report is a compilation of the different segments of the APAC air purifiers market, including market breakdown by filter technologies, coverage area, end-user industry and geographical areas. Herein the revenue generated from the filter technologies, namely: HEPA, activated carbon, electrostatic precipitator, ionization, and others; coverage area, namely 100 sq. ft. to 200 sq. ft., 200 sq. ft. to 400 sq. ft., and more than 400 sq. ft.; end-users, namely residential and commercial such as offices, hotels and restaurants, embassies, educational institutions and hospitals, clinic, & healthcare facilities; and country, namely: China, India, South Korea, Japan, Indonesia, Singapore, Malaysia, and Thailand is tracked to calculate the overall market size, both in terms of value ($million) and units (‘000 Units). The report also provides market numbers and analysis on cross segments which includes country by filter technologies, coverage area, and end-users. While highlighting the key driving and restraining forces for this market, the report also provides a detailed summary of the APAC air purifiers market. It also includes the key participants involved in the industry at the relevant sections. • What is the size, in terms of value ($million) and units (‘000 Units) of the APAC air purifiers market in 2016, and what will be the growth rate during the forecast period, 2017-2026? • What is the market size of different filter technologies of APAC air purifiers ($million and ‘000 Units) and their growth rate during the forecast period, 2017-2026? 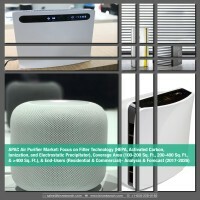 • How will each coverage area type of the APAC air purifiers market grow during the forecast period and what will be the market size ($Million and ‘000 Units) of each of the coverage area types by the end of 2026? • How will each end-user industry of the APAC air purifiers market grow during the forecast period and what will be the market size ($Million and ‘000 Units) of each of the end-user industries by the end of 2026? • What is the market size for different countries in terms of value and units ($Million and ‘000 Units) in the APAC air purifiers market and their growth across the forecast period, 2017 to 2026? • What are the major driving forces that tend to increase the demand for the APAC air purifiers market during the forecast period? • What are the major challenges inhibiting the growth of the APAC air purifiers market? • What is the competitive strength of the key players in the APAC air purifiers market by analyzing through market share analysis? • Who are the key market players in the market, along with their detailed analysis & profiles (including their financials, company snapshots, key products & services, and SWOT analysis)? The report further includes a thorough analysis of the impact of the Porter’s five major forces to understand the overall attractiveness of the industry. The most commonly used strategy for developing a better hold on the market has been through product launches. Moreover, the company profile section highlights significant information about the key companies involved along with their financial positions, key strategies & developmental activities of the recent years. Further, the report includes an exhaustive analysis of the regional split into Asia-Pacific, South East Asia, and China. Each geography details the individual push and pull forces in addition to the key players from that region. The prominent players operating in the APAC air purifiers market are Panasonic Corporation, Samsung Corporation, Daikin Industries Ltd, Honeywell International Inc., Blueair AB, and Eureka Forbes, among others. 9.8 Midea Group Co. Ltd.
Air pollution and degrading air quality has emerged as one of the key concern across the globe. Increasing air pollution levels has led to rising health concerns including accelerated aging of lungs, degrading lung capacity, major respiratory diseases such as asthma, bronchitis, emphysema, and cancer, among others, along with environmental concerns. Regions such as Asia-Pacific are one of the worst sufferers of such a crisis as several countries in the region are exposed to various indoor and outdoor pollutants which degrades the air quality. India, China, Japan, Indonesia, Singapore, and Malaysia, have unhealthy levels of air pollution due to increasing number of vehicles, illegal forest fires, and nuclear plant emissions, among others. Owing to the increasing levels of air pollutants and degrading air quality index (AQI), air purifiers are manufactured and are widely used to prevent the intake of impure air inside closed spaces such as houses, offices, school, and others. Air purifiers contain varied filter technologies such as HEPA filter, activated carbon filter, electrostatic precipitation, ionization, and pre filter, among others. They are used to capture pollens, air borne allergens, harmful gases such as oxides of sulphur and nitrogen, volatile organic compounds, and bacteria, among others. These air purifiers are installed based on their efficiency and coverage areas. It is advisable to install air purifiers with coverage area more than the room area. In terms of value, the APAC air purifiers’ market size was estimated to be $34,518.6 million in 2026 growing at a CAGR of 24.5% between 2016 and 2026. The market has been experiencing a rapid growth rate since the past few years owing to the economic development, increasing air pollution levels, and growing awareness among consumers regarding the advantages of air purifiers. The increasing pollution levels in the countries of Asia-Pacific such as India, Japan, China, and Indonesia, among others, stringent governmental regulations regarding the indoor air quality index, and increasing health and environmental concerns are the major accelerators of the growth of the air purifiers market in the Asia-Pacific countries. The APAC air purifiers market can be classified by filter technology which include HEPA, activated carbon, ionization, and electrostatic precipitator. HEPA filter technology is expected to be the largest and fastest growing segment of the APAC air purifier market both by value and units with a market share of 38.4% and 45.0% respectively in 2016. Coverage area is an important criteria for the selection of air purifiers for different applications. Air purifiers for coverage area of more than 400 square feet is expected to be the fastest growing market in terms of value and volume. They find applications in hotels, offices, schools, metros, large crowded areas, and hospitals. Mid-sized coverage air purifier is expected to witness a healthy CAGR in the forecast period owing to boosting residential application in Japan, South Korea and China. The APAC air purifiers market revolves around the major end-use industries which include residential and commercial sectors. The commercial end-user industry dominated the APAC air purifiers market in 2016 and is expected to grow at a CAGR of 25.2% respectively between 2017 and 2026. Air purifiers are increasingly used in embassies across the APAC region. It is due to rapid industrialization, increasing employment opportunities, education exchange programs, increased tourism and political aspects bringing expats in the APAC region. The trends of the APAC air purifiers market varies with different geographical countries. The APAC air purifiers market holds a prominent share in various countries of Asia-Pacific (APAC) such as India, China, Japan, Malaysia, Indonesia, and Singapore, among others. China is dominating the APAC air purifier market on account of growing consumer awareness about air purifiers and increasing vehicular emissions leading to the growth in the pollution levels. Additionally, increasing industrialization and growing consumption of coal for power generation leads to rise in soot and degradation of the indoor air quality that consequently propels the growth of the air purifiers market in China. The competitive landscape for the APAC air purifiers market demonstrates an inclination towards companies adopting strategies to expand their business, launching products with innovative technology, and focusing on research and development activities. Some of the major established players in the APAC air purifiers market are focusing more on product launches to keep a strong hold on the market. Panasonic Corporation, Samsung Corporation, Daikin Industries Ltd, Honeywell International Inc., Blueair AB, Eureka Forbes, Whirlpool Corporation, Coway Co. Ltd., LG Corporation, Midea Group Co. Ltd., and Sharp Corporation are some of the prominent companies in the APAC air purifiers market. These companies are actively aiming at an increased number of agreements, partnerships, & collaborations, and products to expand their operations, thereby, enhancing their share in the APAC air purifiers market. These companies expanded their business in different countries to increase their customer base in the market.